In Chinese Medicine, it’s believed that acne that flares up on different parts of your face represents health problems on diff rent parts of your body. Kind of like, this part of your face corresponds to this organ. 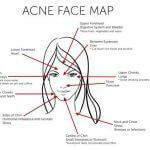 To know what conditions you’re suffering from, just look at where your acne is. When you’ve got poor digestion going, the body will have troubles breaking down food and there may be a large buildup of toxins. Be sure to drink plenty of water to flush out toxins and keep an eye on your diet by eliminating foods with high fats and sugars, as well as eating plenty of fruits and vegetables. Some of the best antioxidant rich foods or drinks include green tea, lemon water and berries. Your heart is a massive organ that pumps blood all over your body. If it’s stressed out due to poor diet, inactivity and various mental and physical stresses, then not only are you likely to get pimples on your lower forehead, your entire body will be doomed if you don’t fix the problems. Having a healthy heart means to do regular exercises to strengthen the heart, as well as eat a healthy diet, and keeping stresses low. When kidneys are not taken care of, you’ll find these large, painful pimples on your ears that refuses to leave no matter what. Kidney troubles are often caused by not drinking enough water and taking in too much salt and caffeine, so be sure to drink plenty of water in a day, cut down on the salt and caffeine and cleanse your kidneys with diuretics such as parsley and water. Oiliness, redness, flakiness and pimples between the eyebrows can indicate that your liver may have been overworking and need a cleansing. Cut back on fatty, sugary, greasy and rich foods, alcohol and diary, particularly if you’re lactose intolerant. Avoid eating late at night as well. Your liver will spend an extra amount of effort processing saturated fats, so try not to go over with them. Some of the best foods to cleanse your liver include garlic, grapefruit, green tea, carrots, beets, leafy green vegetables, lemons and limes. Stresses to the lungs is likely to cause flare ups in the upper cheeks and even break your capillaries. These stresses include smoking, asthma, allergies, lung infections and living in a polluted area. The best thing to do is to avoid smoking as much as you possibly can, especially through passive smoking, which could be even worse than actually smoking. Gum or teeth problems may contribute to acne in the lower cheeks area. Be sure to avoid eating artificial sugar or softdrinks. Keep your teeth in great condition by exercising them regularly through biting down on them. Be sure to floss and brush your teeth each day without brushing them so hard that it breaks your enamels. This may affect a lot of girls. When sides of the chin often flare up, it’s a sign of hormonal imbalance, often caused by menstruation. Sometimes, even emotional or physical stress can cause hormonal imbalances. Be sure to de-stress yourself and get plenty of sleep. Cut down on all the bad foods and focus on a healthy diet rich in vitamins and minerals. Be sure to take lots of essential fatty acids such as Omega 3. There are also herbs that can help balance hormones such as licorice, schisandra, holy basil, maca, burdock, red raspberry leaves, rhodiola and milk thisle. Green tea is also a brilliant anti-androgen. This is also caused by poor diets and food allergies. Be sure to eliminate those bad foods (because every part of the body hates it, not just your intestines). Also, be sure to include plenty of fibre in your diet. Chest areas are usually caused by stress, so be sure to figure out what’s stressing you out and try to eliminate that stress. It’s also important to be comfortable in your outfits. When areas around the neck flare up, it’s often caused by your body fighting off infections. Be sure to support your body by resting, eating a healthy diet and drinking plenty of water.